"Memories made at the beach last a lifetime". I know for a fact that some of my best memories are from seasidy days. that I won't ever forget this perfect day at the beach. and how you feel right this second"
because I genuinely could not have been happier anywhere else in the entire world. going on about how much I love the seaside. and sandcastle building an all day pastime. while we were in Wales staying at Bluestone. They are just two of the beaches that have made that part of the country so famous. which we've heard is equally beautiful. because you have to hike up a hill, over a cliff and down again to get to it. but not nearly so easy to get away from. and we had a perfect family day enjoying nature's playground. I'm completely with you in the beach adoration club; so many of my childhood memories come from being on the beach down home and whilst I'll never actually admit that there could be any beaches better than those in South Devon, I'll admit they look very lovely! I've also got a theory that the harder the beach is to get to, or from, the better the reward when you do reach the sea! Oh I love your videos there are AMAZING!!! I am the same I have moments like that with the kids and Mr P where I never want to forget the feeling and that very particular moment. It's almost so amazing tears come. So glad you get those too at the beach! 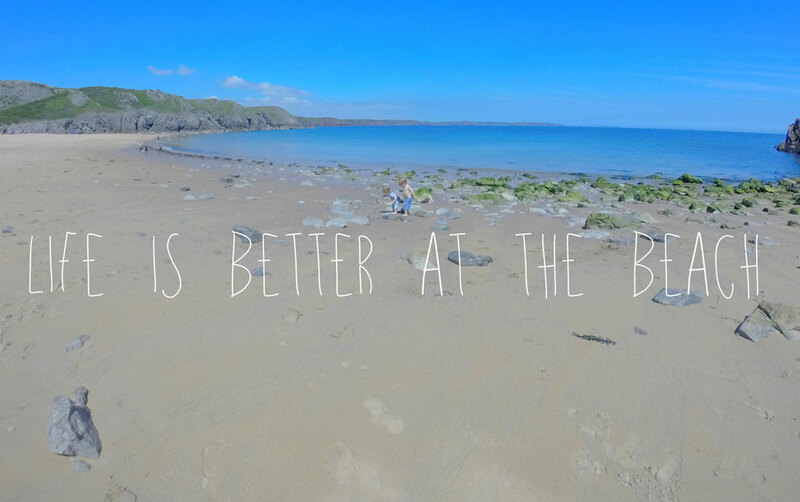 the beach truly is an amazing place to make memories all year round I couldn't agree more. The double team should take all our families to the beach one weekend! That would be amazing all the kids playing around. lol I could watch all your videos for hours. So amazing. i keep telling myself I want to record more of the kids but haven't. A lovely post, great to see a difference with the video. I couldn't agree more about the beach, we love spending days out. We live in Wales, so the choice of beaches is huge for us, we really are very lucky. Truly happy family moments after a beach day. A lovely video to treasure of having great family fun together in some beautiful locations. You definitely did find two stunning beaches and the hikes were definitely worth it. Thanks for linking up and sharing with Country Kids. That's a beautiful video, you had a lovely day. It looks like a stunning beach. Perfect combo of everything, sun, sea, sand and peace! It makes me want to go! Gosh you have had such a busy Summer so far. I'm impressed with the amount of days out you have had and that you are all making use of the sunshine. Did you know you can stay at National Trust holiday cottages at Stackpole Quay or at their Stackpole Centre within walking distance of Barafundle? Just £26 per person per night at the Centre!